Saturday’s event raised a record $2,063,000, and we have consequently added six new works to our collection, ranging from a seventeenth-century Japanese screen to a nineteenth-century painting to a variety of masterful pieces of Tibetan furniture, as well as three works of contemporary art. Here’s a look at the night’s bounty. 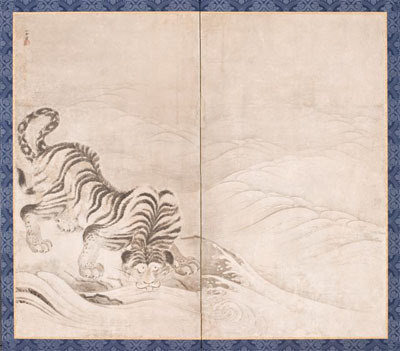 Kano Sansetsu, Tiger Drinking from a Raging River, c. 1640. This two-panel folding screen dates to Japan’s Kanei period (1624–1644). According to curator Robert T. Singer, Sansetsu is among the most original Japanese artists of the seventeenth century. Tiger Drinking from a Raging River is the first work by the artist to enter the collection of any museum outside of Japan. Over the weekend the screen was installed and is now on view in the Pavilion for Japanese Art. The Hayward Family Collection of Tibetan Furniture. 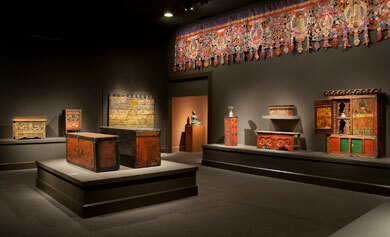 The Hayward Collection contains 39 masterpieces of virtually every important type of Tibetan furniture, dating from the late 12th to 20th centuries. 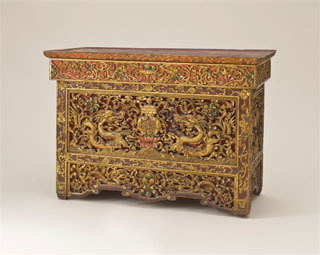 Tibetan furniture was typically made for Buddhist monasteries and households, and features vibrant colors and ornamentation. With this acquisition, LACMA’s collection of Tibetan and Nepalese art has been elevated to the most comprehensive public collection in the world. This collection is already on view in the exhibition In the Service of the Buddha: Tibetan Furniture from the Hayward Family Collection. 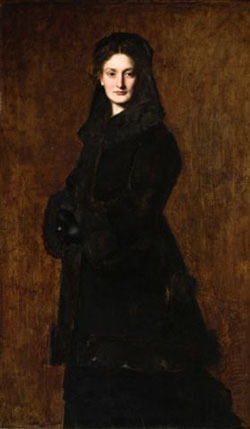 Jean-Jacques Henner, Portrait of Madame Paul Duchesne-Fournet, 1879. Though Henner is known for his nudes and landscapes, earlier in his career he was a sought-after painter of religious subjects and portraits. Curator J. Patrice Marandel writes of the piece, “Among the portrait painters of his generation, Henner developed a distinctive style. Less voluptuous than Carolus-Duran’s but more spirited than Leon Bonnat’s, Henner’s portraits were particularly appealing to a clientele eager to display in a dignified manner their newly acquired wealth and social rank.” Indeed, this portrait gained some renown at the time of its creation when Henner charged his subject, the wife of a prominent politician, 10,000 francs—an extravagant sum in its day. John Baldessari, Portrait: Artist’s Identity Hidden with Various Hats, 1974. 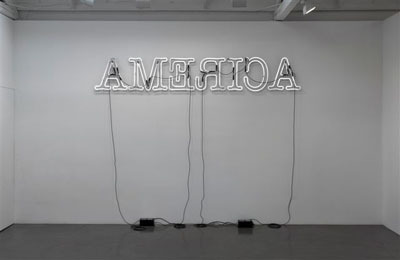 LACMA has a number of Baldessari works in its collection, with particularly important works from the 1960s (Wrong) and the 1980s (Heel), but Portrait is the first significant work of the artist’s from the 1970s to enter the collection. It will be featured in the upcoming retrospective John Baldessari: Pure Beauty, opening at LACMA in June. Look for future Unframed posts on some of these works; we’ll also let you know when any of these go on view. Update: See today’s Los Angeles Times for more on Saturday’s event. This entry was posted on Monday, April 19th, 2010 at 6:00 am and is filed under Uncategorized. You can follow any responses to this entry through the RSS 2.0 feed. You can leave a response, or trackback from your own site. John Baldessari, Portrait: Artist’s Identity Hidden with Various Hats, 1974.Half a million for this work and you don’t have a gallery to put it in. What a waste of resources. Hi John – as you’ll note in the post above, the Baldessari will be on view in BCAM beginning in June. 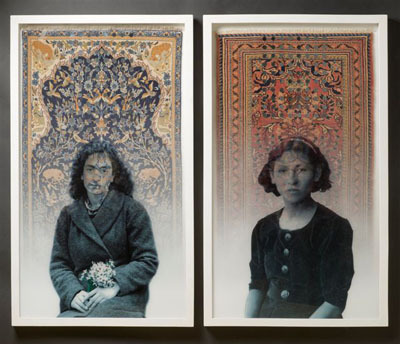 Hooray for LACMA’s Acquisition Committe. We as members and supporters appreciate your efforts and contributions! I will be taking a class with Collette Chattopadhyay from Sadleback Emertius program on Asian Art. I am looking forward to using the Pavilion for my follow-up studies and especially seeing the Tiger Drinking… by Sansetsu. I love my new membership, the Impressionist Class, the Renoir exhibit, and the American Stories. What a treat to have LACMA providing all of these wonderful experiences. Thank you Bob, Ann, and Pat for your support!